Half the battle to growing a successful business is knowing what media you are able to leverage to get your targeted messages in front of your prospects. Once you know what media channels you have available, you can then start creating campaigns within those mediums to effectively reach your top and bottom line revenue goals. This infographic illustrates the different marketing channels you can use to effectively reach your target audience. You can use one or a combination of all of these techniques in any one of your campaigns to help you drive more targeted traffic through your website, online store, or physical brick and mortar location. I have added a comments section below for you to add new marketing channels that I may have not included. Thanks in advance for your help! 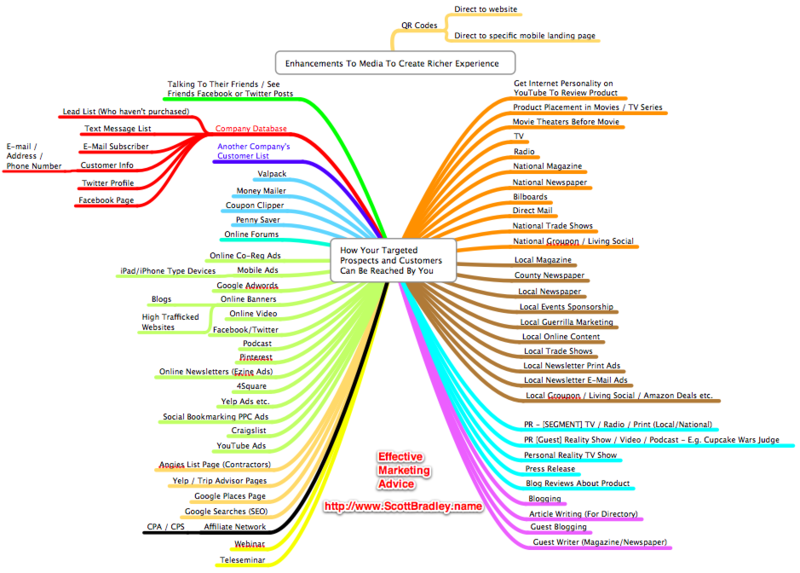 Here are two more channels that came to me after I published this infographic. I am sure more will come up as I continue to think about this graphic! Nice info graphic! Thanks for sharing. I really like the use of color in your mind map. Can a mind map really be an info graphic? Hadn’t thought of it like that before. Thanks again.